Yesterday’s 55-38 win for Old Rishworthians against Bradford Salem had it all - exciting fast paced rugby, 14 tries and a bonus point for the visitors to ensure they stay in Yorkshire One . Rishworthians were brilliant in attack. They had gained a bonus point by half-time and opened the second period in fine style. Then they took their foot off the pedal and allowed their opponents back into the game before finishing strongly. Both sides tried to play expansive rugby, which brought some exciting play with great displays from Rishworthians’ teenage contingent, especially Sam Bake at fullback. But there was some concern for player-coach Chris Stone. “Our momentary lapses showed up a lack of concentration which is the difference between us and the top four sides. His side looked threatening from the start but Salem took every opportunity themselves to run the ball and a fine move in the backs brought them a converted try. From then on it was all Rishworthians and only brilliant Salem tackling held them out. The home side did not get frustrated, although several times they lost the ball in the tackle, and eventually the flood gates opened. Stone put Luke Flanagan away on the right. He was held up short, but the pack came round to take the ball and No 8 Jack Andrews dived over. They soon took the lead, prop Josh Crickmay barging through before the ball came out and Bake showed great pace to burst in and score under the posts. Stand-off Josh Kelly added the first conversion in what turned out to be a great day with the boot for him. 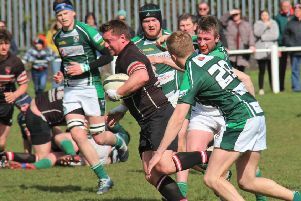 Rishworthians burst out of defence as scrum half Ed Cockroft linked with Bake and Flanagan before man of the match, flanker Harvey Keighley-Payne, took it on to score. Crickmay, fellow prop Harry Whitfield and lock Callum Heseltine all took the ball close to the Salem line before Cockroft spotted a gap and jinked over. Kelly added a fine conversion from wide out to end the half. The second period started with a burst from Keighley-Payne before he picked up at the ensuing scrum and fed Andrews for the No 8’s second try. Kelly converted. From the restart there were strong runs from Whitfield and Crickmay before the ball came to Keighley-Payne in space and he ran in for his second. Kelly converted. Rishworthians were cruising at 40-7 until they took their foot off the gas. One momentary lapse brought a converted Salem try from an interception. They hit straight back, left wing Anthony Shoesmith catching the ball in the air from the restart. The forwards took it on before Heseltine fed it back to Shoesmith and the wing ran on to score in the corner. Kelly added a fine conversion. From then Rishworthians went completely to sleep and Salem ran in four tries, two of which were converted. The first came after good work by the forwards. This was followed by a flowing move bringing a try wide out. A loose ball was snapped up and a dash to line brought a third. Kelly steadied the ship with a penalty to take his side to 50 points, but Salem refused to lie down and scored in the corner with another move. Rishworthians ended the game with their eighth try, Whitfield barging through before the ball went out for Shoesmith to score his second in the corner. It was another try-fest for the Development team at Salem. They scored 13 tries to win 83-5, before the game finished early. There were five tries for Olly Marshall, one each for Gerard Rollings and Kurt Sutcliffe and two each for Rhys Town, Luke Sutcliffe and Joe Billing, who also added nine conversions.